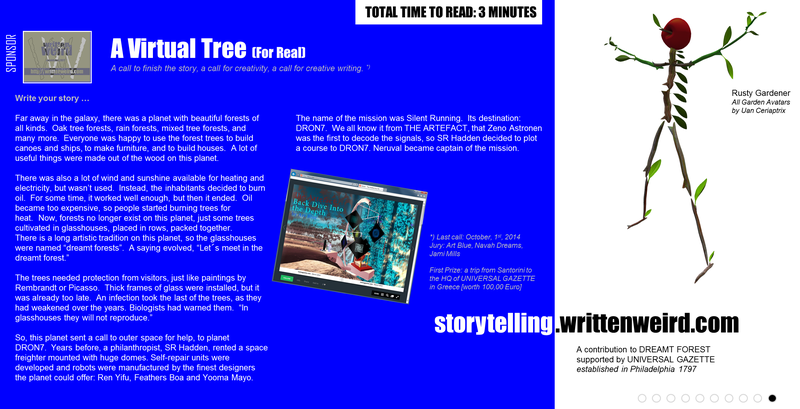 A call to finish the story, a call for creativity, a call for creative writing. Far away in the galaxy, there was a planet with beautiful forests of all kinds. Oak tree forests, rain forests, mixed tree forests, and many more. Everyone was happy to use the forest trees to build canoes and ships, to make furniture, and to build houses. A lot of useful things were made out of the wood on this planet. There was also a lot of wind and sunshine available for heating and electricity, but wasn’t used. Instead, the inhabitants decided to burn oil. For some time, it worked well enough, but then it ended. Oil became too expensive, so people started burning trees for heat. Now, forests no longer exist on this planet, just some trees cultivated in glasshouses, placed in rows, packed together. So, this planet sent a call to outer space for help, to planet DRON7. Years before, a philanthropist, SR Hadden, rented a space freighter mounted with huge domes. Self-repair units were developed and robots were manufactured by the finest designers the planet could offer: Ren Yifu, Feathers Boa and Yooma Mayo. The name of the mission was Silent Running. Its destination: DRON7. We all know it from The Artefact, that Zeno Astronen was the first to decode the signals, so SR Hadden decided to plot a course to DRON7. Now you step in when the first inhabitants of DRON7 arrive and offer this planet help to replant their world. Navah Dreams has already done it in a simulator so you get a picture on what mankind will work in the future to get back. Here comes a little help for kids, as Dreamt Forests were originally designed by Navah Dreams for kids in Greece to learn to create in 3D – named the Primexplorer Project. This entry was posted in Uncategorized on June 29, 2014 by don´t panic. You are right here. Maybe it does not look like a magazine. Weird? Nevertheless it is not our first magazine we´ll produce, but it is the first of a new kind. The concept was developed in 2010 for SPACE NET: The text comes with embedded links and QR-Codes to get the pictures right delivered to your smartphone at P.O.R. [Point of Reading]. That´s why we need stories and pictures. Both have to be outstanding. Made for the future. Today it might look weird for some, but not for everyone. We are in no hurry. We decided to sponsor an artwork in virtual worlds and set up a call for stories at the 2014 Santorini Bienniale. Neruval is mentioned in part 5: I Am Substance. I Am Blue. Ren Yifu, Feathers Boa, Yooma Mayo, Leopard Adored, Uan Ceriaptrix are artists in virtual worlds, supporting DREAMT FOREST by Digital Art you find inworld. Scripting in DREAMT FOREST by Qnav What. Here comes a little help for kids, as Dreamt Forests were originally designed by Navah Dreams [Liliana Papadopoulou] for kids in Greece to learn to create in 3D – named the Primexplorer Project. Meet and chat with a chatbot like Eugene Goostman or Ramona 4.2 or even with Neruval, the owl AI — inworld.